282 pages, all 14 issues published, dating from January 1864 to February 1865, of the Confederate States Medical & Surgical Journal, copied from material held at the Boston Medical Library in the Francis A. Countway Library of Medicine in Boston, Massachusetts. The only medical periodical issued under the Confederacy, the Confederate States Medical & Surgical Journal was published monthly in Richmond, Virginia. 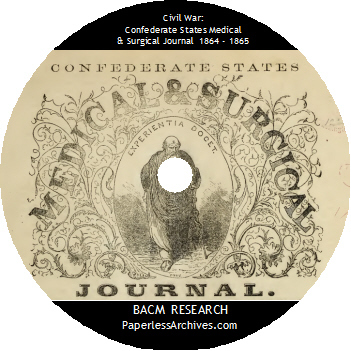 Most articles in the Confederate States Medical & Surgical Journal (C.S.M.S.J) are case reports, reports on the progress of the war, depictions of wound treatment and surgical facilities, hospital reports, descriptions of the uses and supply of drugs, the supply of drugs from plants indigenous to the South, news of medical research in Europe, developments in prosthetics, discussions of disease outbreaks, clinicopathologic correlations, and statistical analyses. Dr. William D. Sharpe wrote in the Bulletin of the New York Academy of Medicine that, "The level of material in the Journal is high, at least as high as that of any of its American contemporaries, although pressures on space are evident in a sometimes excessively terse style." The Confederate States Medical & Surgical Journal (C.S.M.S.J) was edited by Dr. Samuel Preston Moore (1813-1889), the Surgeon General of the Confederate States of America. Moore was trained as a military surgeon in the US Army in 1835 and continued to serve as a surgeon until 1861. While serving as a surgeon during the Mexican�American War, Moore became friends with Col. Jefferson Davis, the future Confederate President. Moore resigned his commission as a U.S. Army surgeon on February 25, 1861 and returned to his medical practice in Little Rock, Arkansas. Davis appointed Moore to the position of Surgeon-General of the Confederate States Army Medical Department on March 16, 1861. Doctors Peter N. Purcell and Robert P. Hummel Jr. writing about Moore in the American Journal of Surgery described his career as CSA Surgeon General, "He reformed the mediocre medical corps by raising recruiting standards and improving treatment protocols and by placing the most capable surgeons in positions of authority. He improved the ambulance corps and directed the construction of many new hospitals for Confederate casualties. He was directly responsible for the barracks hospital design, which is still used today. He established the Confederate States Medical and Surgical Journal and directed a successful effort to develop substitutes for scarce pharmaceuticals from the indigenous flora of the South. He founded the Association of Army and Navy Surgeons of the Confederate States of America. With skill and dedication, Dr. Moore transformed the medical corps into one of the most effective departments of the Confederate military and was responsible for saving thousands of lives on the battlefield." The physical format of the C.S.M.S.J was letterpress in double columns, quarto with a page size of 9 x 12 inches. From January 1864 through July 1864, each issue contained 16 pages. From August 1864 until the journal ceased publishing, each issued contained 24 pages. The Journal was published by Ayres and Wade the publishing company that also produced the Southern Illustrated News. The subscription price to the Journal was published as $10.00 yearly until September 1864, when the subscription price was raised to $20.00. 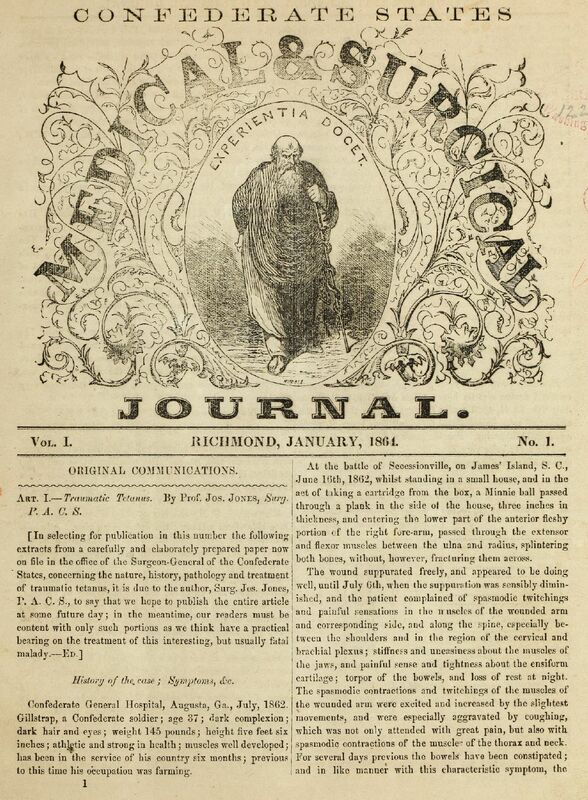 The cover of the first eight issues of journal is decorated with a large florid half-page masthead illustration of either Aesculapius or Hippocrates underneath the journal's motto, "Experientia Docet," which translates from Latin to English as "Experience is the best teacher." From the ninth issue on, the cover page displayed the title entirely in type. "It is proposed to commence the publication of a medical periodical in this city on the 1st of January next, and the co-operation of the army and navy medical staff and of the profession at large is respectfully solicited. The responsible position which the southern medical profession holds before the country, demands that there should be some exponent of its unprecedented efforts under the most adverse circumstances, during this war. Having free access to the reports and archives of the Medical department and acting in concert with the Association of army and navy surgeons, this journal purposes to be the impartial representative of the profession, by collecting and elaborating the valuable results of its labors. Through this medium also, we can be brought into communication with our brethren in other countries, and a chronicle of medical science, carefully collated from recent English and Continental periodicals will be a leading feature. In short, no effort will be spared by its conductors to lay the foundation of a Southern medical literature on a firm and enduring basis." The most advanced thinking and treatments are reported. Unusual cases are documented and new scientific discoveries are noted. Original ideas are explored. The conscientious reader, had he been able to abstract himself from his more pressing cares, would have been intellectually prepared for the climate in which the great advances of the last third of the 19th century would take place: the importance of cleanliness and rest in the healing of wounds, the routine use of laboratory aids in diagnostic dilemmas, the contagiousness of disease, and the importance of careful clinical and autopsy correlation." Articles on making medicines from the plants indigenous to the southern states. The Union embargo hindered medicine from reaching the South and Dr. Moore sought alternatives. The July 1864 issue included the "Standard Supply Table of the Indigenous Remedies for Field Service and Sick in General Hospital." This list contained the official names, common names, medicinal properties, dosages, and uses for 64 indigenous plants, listed as substitutes for established but unavailable drugs. Papers written by William T. Wragg of Charleston, South Carolina on the yellow fever epidemic of Wilmington in 1862. After the war, his work was published in the New York Medical Journal. A report by Jackson Chambliss on the "Case of Traumatic Femoral Aneurism Treated by Digital Compression, Ligation afterwards of the External Iliac Artery," is a detailed account documenting an unsuccessful case with autopsy findings and a thorough clinicopathologic analysis. 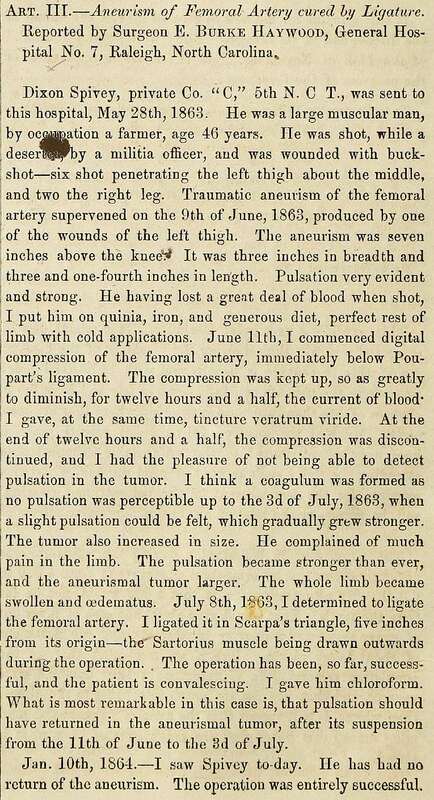 The Journal included a regular section called, "The Chronicle of Medical Science." The purpose of this feature was to import information about medical developments from foreign countries to Southern physicians. 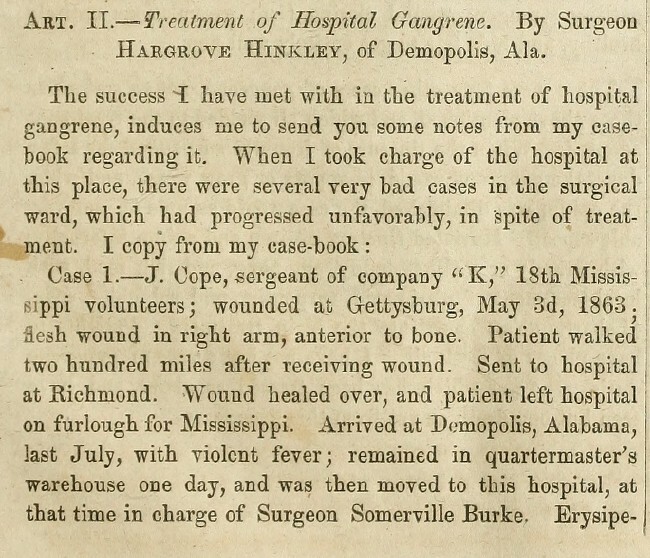 The war and its blockade of the South prevented doctors from receiving medical journals from outside the Confederacy. Thomas K. Chambers' article, "Treatment of Pneumonia and Pleurisy," summarizes the treatment of those two conditions. The article covers physical diagnosis, natural history, morbid anatomy, pathogenesis, and drug therapy. A Manual of Military Surgery Prepared for the Use of the C. S. A. Army (1863). An illustrated 359 page manual created by the Confederate Surgeon-General office. Dr. Samuel Preston Moore directed the collection and publishing of this set of papers, in the form of a concise handbook for the use of medical officers in the field. 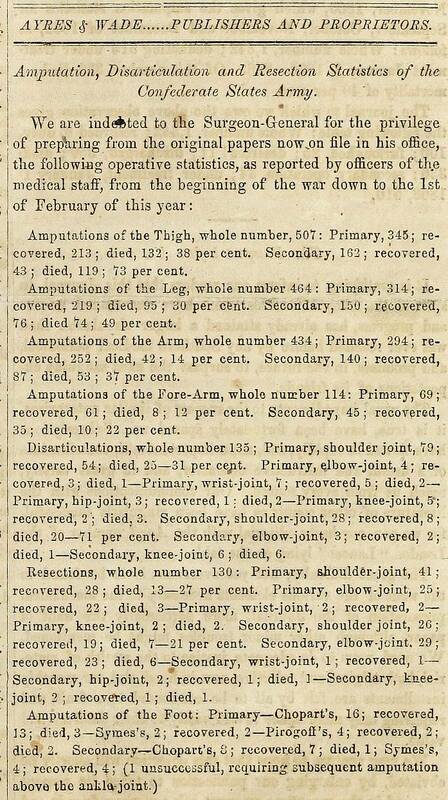 Circular: Maintenance and Use of Records of Gunshot and Other Wounds (1862) - Issued by the Confederate Surgeon General, Moore emphasizes the importance of recording information about wounds received in combat. Report of the apportionment of the general hospitals in and around Richmond February 13, 1864.